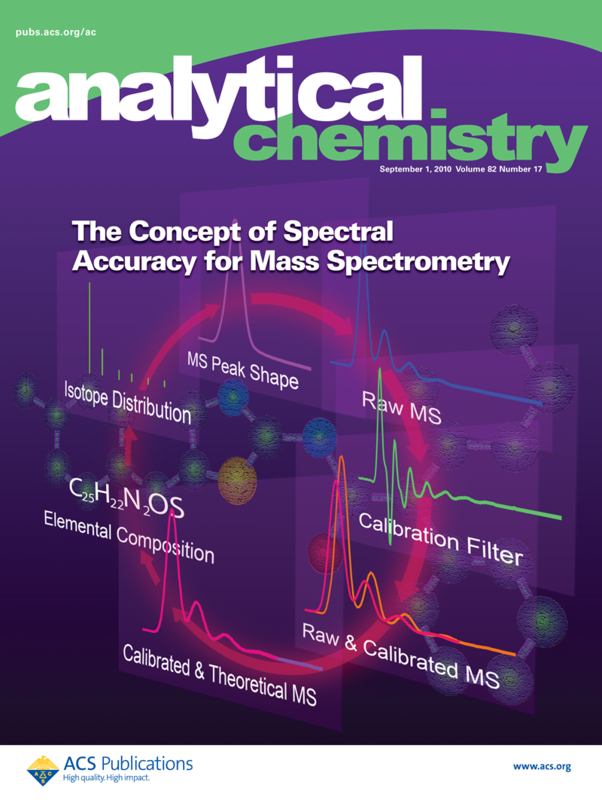 Cerno publishes award-winning mass spectrometry calibration and analysis software which not only enables formula determination at unit mass resolution (single or triple quad) with 100x improvement in mass accuracy (CLIPS), a capability typically reserved only for HiRes MS systems, but also improves formula ID at HiRes by 20x through the Spectral Accuracy concept (sCLIPS). These dramatic results are enabled through the patented TrueCal™ calibration process and validated by hundreds of publications and thousands or satisfied users across the world. 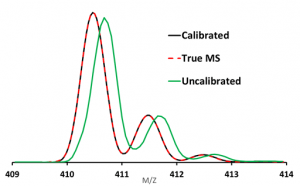 MassWorks TrueCal™ calibration technology provides advantages for both high and low resolution instruments. 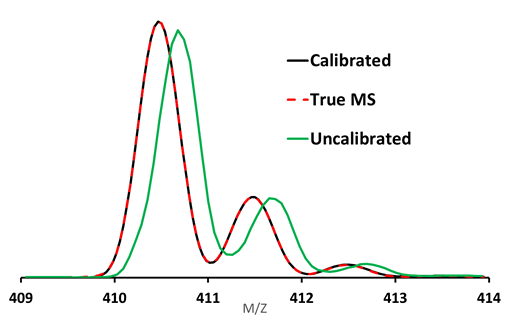 The above left figure shows an almost perfect match (Spectral Accuracy) between a calibrated single quad and the corresponding “True” calculated MS using the CLIPS search. The figure on the right shows excellent spectral accuracy match for confident formula ID on a high resolution TOF instrument using sCLIPS search. 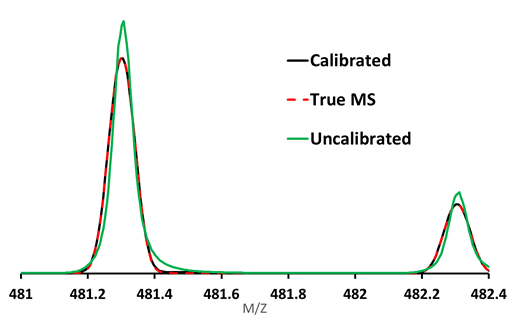 Proper mass spec calibration also means that complex mixture deconvolution of overlapping and interfering ions is easy and provides the most accurate quantitative results. 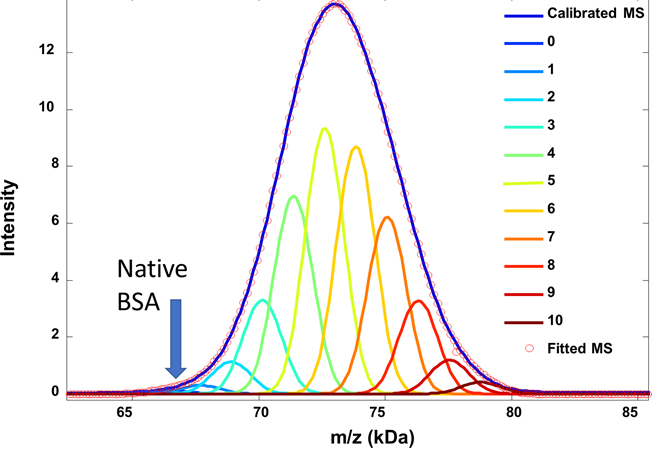 The top figure shows the accurate quantitative analysis of 7 component mixture of a C13 radio labeled pharmacutical using a quadrupole instrument. 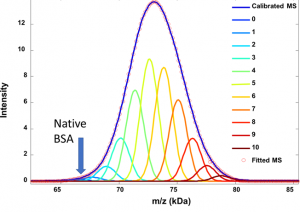 The bottom figure shows the ability to detect and deconvolve modified products (glycan conjugates 0 – 10) of a large molecule intact protein (by Maldi) (see ASMS poster). This type of analysis is not possible by other means! Learn more about GC/ID here. 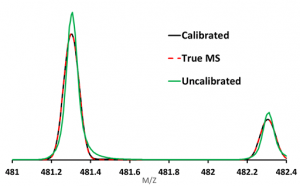 With over a dozen patents and 1000’s of users, the award winning MassWorks established the performance benchmark for “True” mass spec calibration. MassWorks is a Windows based desktop software that works with most MS vendor instruments by directly reading the data files making the powerful calibration and analysis technologies available to both nominal and high resolution instruments. Learn more about it here. Get your NIST GC/MS libraries for use with MassWorks Rx GC/ID or stand alone for any GC/MS system. Also learn how to use the NIST accurate mass MS/MS libraries with your unit resolution quadrupole! "The program is very easy to learn, it literally took minutes to get the first exciting results. On our 10 year-old triple quad, we manage to achieve mass accuracies of 10 ppm or better, routinely! It has become an integral part of our characterization pipeline for newly synthesized compounds." "Determining the elemental composition of pure materials at modest resolution typical of quads has never been routinely practiced – CLIPS brings that task very close to practice for the general user. It is not too much of a stretch to suggest CLIPS will enhance the confidence of TOF-based assignments as well, which may even challenge slower FTMS-based determinations." "Your software [MassWorks] continues to amaze. Your first candidate is indeed the unknown -- atranorin [LC/MS]. I'd like to get the software that works with both our Shimadzu GC-single quad and our Shimadzu LC-triple quad." "MassWorks has proven itself on our GC/MSD system for accurate mass measurements and unknown formula ID. When applied to LC/MSD, it also worked amazingly well to provide accurate mass results for the identification or confirmation of small molecule organic compounds"